Looove this! Especially number 5. That is an interesting list. 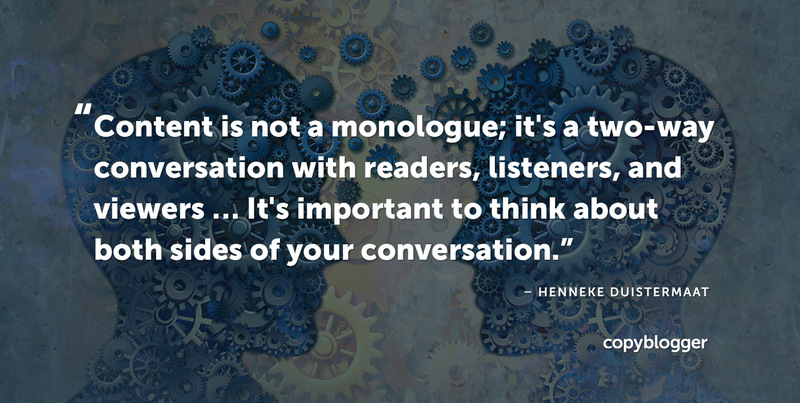 Can you explain a bit more about how those play out when writing content? Excellent article with some really great advice. I’m one who struggles with content creation ideas so this was exactly what I needed. I do have one question though. As for repurposing content, if I take a blog post and create a video out of it on YouTube, should I then embed that video on the same page as the blog post or create a new post with only that video? Also, would something like this be considered duplicate content? I’m really looking forward to your thoughts on this. Thanks. Go with whatever works well for your audience. I often just append a note at the bottom of a post saying, “If you like audio content” or “If you like infographics,” that kind of thing, and then include a link or an imbed for those who are interested. Duplicate content is mainly something you shouldn’t be too worried about unless you are a) scraping content (which would be a very bad thing to do), or b) run an ecommerce site and have dozens or hundreds of almost identical pages. For the latter, you can add what’s called a canonical tag to let search engines know which page is the “real” one. As far as having the same content in different media, like a blog post, podcast episode, and video, duplicate content won’t be anything you need to worry about. Wow. This still seems so big of an idea (I am ok at creating content). I saved this to my pocket. I’ll read it for a 3rd time to see if I can get a better understanding of the situation. And, are you still running your podcast? I love this. Really well structured – exactly like a good content marketing strategy, I guess! I like Ogilvy’s idea of a ‘big enough idea’, because it doesn’t go too far into the realm of doing whatever it takes to shift products. There’s something genuine about it, and that’s important because everyone working for your company can get on board with a simple idea which is honest but motivating. A great marketing campaign doesn’t just influence your customers, it influences your team as well, which benefits the company in many other ways in the long term. Great read and something I will refer to as I write more. Cornerstone content has such a massive impact on so many levels. I find that sometimes when I write cornerstone content, it opens the door to writing on so many other topics. It forces you to think thru so many different angles that every article after that seems much simpler. Hi Sonia, some really good advice, especially about getting structure into the whole content marketing process. I think number 2 is vitally important to the whole process. Rather than sit down and brainstorm what their big idea is many writers just start writing and hope something will come to them. I also liked the definition of “big idea” as “an idea that is instantly comprehended as important, exciting, and beneficial. It also leads to an inevitable conclusion, a conclusion that makes it easy to sell your product.” This makes a lot of sense. Finally, number 8 is critical if you are going to get the most out of your budget. So much money can be spent on building quality content that it is a really good idea to be thinking during the planning stage in terms of how it can be repurposed. A really helpful post Sonia. I often have the ‘big idea’ but not the structured process to help me follow through. This article will definitley help me. Thanks.